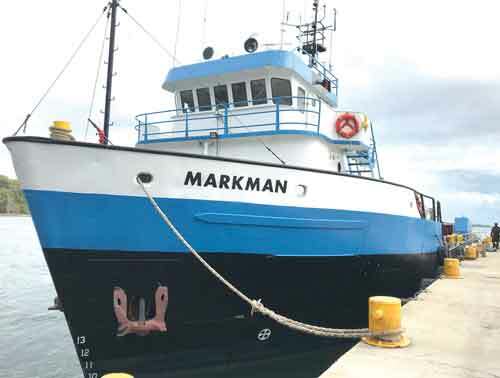 CGX Energy Inc. has deployed the MV Markman to Guyanese waters to conduct a Shallow Hazards Survey at its planned Utakwaaka-1 exploration well location. CGX’s Executive Chairman, Professor Suresh Narine; Drilling Manager, Mr. Michael Stockinger, along with other technical employees of the company viewed specialized seismic equipment on the ship last week when it was docked at Pier 1 in the Port of Chaguaramas in Trinidad. The Utakwaaka-1 well, which was in 2018 named by Guyana’s Indigenous Peoples in a blessing ceremony at the Umana Yana, is to be drilled on or before November 27, 2019 on the company’s Corentyne Block. The Corentyne Block, which is adjacent and to the Southeast of Exxon Mobil and partners of the Stabroek Block, is located over the continental shelf, in shallow water. As such, the company will be utilizing a Jack-Up drilling rig on the well. Jack-Up rigs plant legs onto the ocean floor and are literally jacked-up on those legs with the rig barge being erected on the legs above the surface of the ocean. Shallow Hazard surveys, which are performed using specialized seismic equipment, are intended to establish the topography of the surface, the existence of any wrecks and other encumbrances and the existence of any pockets of subsurface gas. Kaieteur News understands that this information is vital to safety and in guiding where the Jack-Up is positioned on the seabed. The MV Markman is crewed by eight individuals and another 20 technical staff members are on board to conduct the survey, monitor for marine mammals, manage environmental emissions and immediately process seismic and geo-positioning data that is being collected. CGX announced earlier that it had entered into a contract to utilize the Ralph Cowan Jack Up Drill Rig, from the ROWAN RIGS S.À R.L company based in Houston, Texas to drill Utakwaaka-1. Company officials indicated to Kaieteur News that the survey is being conducted by the company Geoquip Marine, which will also perform a Soil Boring test for the company at the Utakwaaka-1 site in late April to early May this year. Since December 2017 when CGX Energy was able to renegotiate its work plans and renew its licenses on the offshore Corentyne and Demerara Blocks and the onshore Berbice Block, the company has reasserted its role as a major exploration player in the Guyana basin, having been one of the early pioneers in the Basin. It had previously drilled three onshore and three offshore wells. CGX, through its 62 percent owned subsidiary, ON Energy, recently completed a Geochemical Survey on its onshore Berbice Block and announced plans to resume work on the company’s deep water port project at Crab Island in Berbice. The port project is being conducted through the company’s wholly owned subsidiary, Grand Canal Industrial Estates.